If you haven't heard of Abigail Washburn before then you're in for a real treat. Before I tell you about her new UK single, "Chains (Remix)" being released on June 6th (LISTEN BELOW), let's do a little bio review, first. 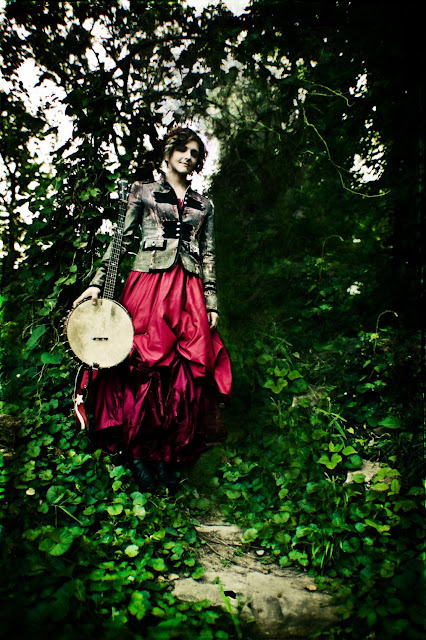 While the talented singer/songwriter/clawhammer banjo player originally hails from Evanston, IL (about 20 minutes North of my hometown), she's definitely got international appeal. After becoming the first ever East Asian Studies major at Colorado College, Washburn had planned to move to China but a road trip out East changed EVERYTHING.stalled that plan and took her in a completely Along the way, she stopped at the International Bluegrass Music Association conference in Louisville, KY where she had just planned on learning a couple of banjo tunes...which turned into a demo session for a record deal in Nashville and VOILA! China trip cancelled, time to move to Nashville! Joining forces with Americana/old-time music band Uncle Earl in 2004, Washburn recorded two albums with the group and toured extensively with the band. In 2005, while still with Uncle Earl, Washburn released her debut solo album, Song Of The Traveling Daughter on the Nettwerk label. As if working with Uncle Earl and on her own solo material wasn't enough, Washburn began work on yet ANOTHER side project, joining up with cellist Ben Sollee, Béla Fleck on banjo and Casey Driessen on fiddle - becoming The Sparrow Quartet. The Sparrow Quartet would go on to tour in China and the following year, at the behest of the U.S. State Department and the American Center for Educational Exchange, Tibet for the first official tour of a U.S. band in that country. Releasing their own album in 2008 (also on Nettwerk), The Sparrow Quartet was a critical success and would go on to tour North America in 2008 and 2009 including appearances at Bonnaroo, Vancouver Folk Festival and many more. 2008 also saw Washburn volunteering in China at an arts school and volunteering for Sichuan Quake Relief after the May 12, 2008 Sichuan Earthquake. With China still fresh on her mind, Washburn released a benefit EP called Afterquake in 2009 to honor the victims of the China quake. Returning to China again, Washburn and the Shanghai Restoration Project went into the disaster zone and captured the voices of those affected by the quake and sampled sounds from the devastated areas. Recorded in 2 and a half weeks, the Afterquake EP blends folk music with electronic sounds and sound clips and samples gathered in China to create a compeltely unique auditory experience. 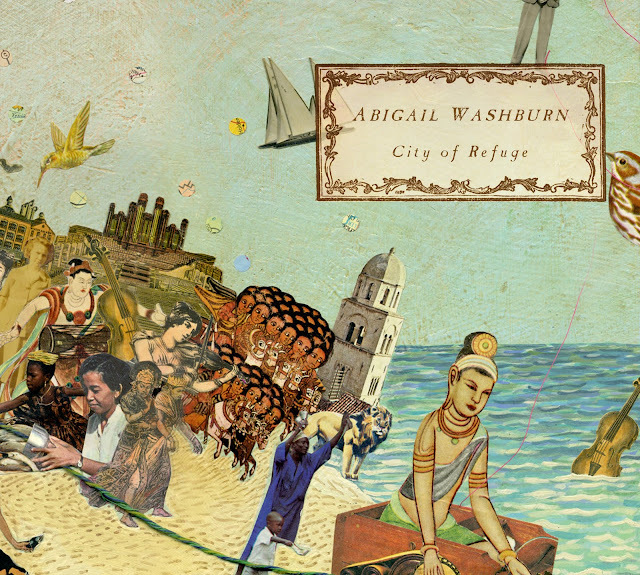 In January of this year Washburn released her highly anticipated, critically acclaimed sophomore solo album, City Of Refuge, which went on to peak at #2 on Billboard's U.S. Bluegrass chart and #9 on the Top Heatseekers chart. Currently finishing up a tour in the States, which included dates at SXSW, Washburn will head over to the UK for a show in London on May 20th, followed by a string of UK dates all leading up to the release of her new single - "Chains." This will be Washburn's second UK tour already this year, having just toured at the beginning of the year in support of her album's UK release. Busy last couple of years for this fabulous talent but it all seems to be paying off in dividends. Not only has Abigail Washburn discovered a new passion for music but she's able to do a world of good with her combined talents and humanitarian sensibilities. Commendable. Props to my former Evanston neighbor! To celebrate the forthcoming single's UK release, we're giving away a free download of the title track off of her City of Refuge album. Snag that below and U.S. fans...make sure you check out City of Refuge on iTunes HERE. You can also check out her entire back catalog - both solo and otherwise - HERE. Tour dates - both Stateside and U.S. - can be found below.